If you are a woodworker whose projects involve too much of making cabinets and drawers,then chances are that you will need a good quality dovetail Jig. This tool creates joints in parts like drawers that are aesthetically appealing and also showcase the quality of artistry input in the entire project. Initially, making dovetail joints seemed to a challenge for most artisans, but today things have been made easier through the innovation of Jigs and other jointers. This article in its part is a valuable compilation of a buying guide, tips on using the tool and how to make the dovetail joint as well as well-crafted reviews of 5 best Dovetail Jigs in the market currently. A dovetail is an exceptional joint in certain ﻿woodworkin﻿g applications like attaching drawer fronts. The interlocking nature of this joint helps to keep the drawer front from separating entirely from the drawer sides. It is essential that at this stage we point out that there are several types of dovetail joints and cutting each type requires a slightly different technique. These types include the full-blind dovetail, half-blind dovetail and sliding dovetail. Each of these joints has their own specialty and importance. And although dovetail joints are mostly used in making cabinets, they tend to be rarely concealed, and they are often exposed. Full-blind dovetail joint – this type of joints are commonly used where the construction needs strength and where the joints visibility is of less importance. Half-blind dovetail joints – these are often used in making drawers in cabinets to hide the end of the grain. Like the full-blind dovetail, these type also works to provide strength and quality to construction. Sliding dovetail joints – vitally, the sliding dovetail is usually used to join two wooden pieces at right angles. This joint gives a lot of strength to construction as well tightens up the jointed area. It is employed in various applications like making cabine﻿﻿t﻿﻿﻿ drawers, drawer fronts and partitions. The joint can also be applied in the making of wooden drawer slides in home improvement projects. As you can see, having a dovetail Jig and being equipped with this joinery skill can help you a great deal in some applications. You might find learning the skill time consuming, but once you master it, the results will be fascinating and full filling. The following products are all of exceptional quality and affordable prices. Although their features, sizes, and shapes vary, they all have the capability to provide the perfect dovetail joints in woodwork ﻿applications. 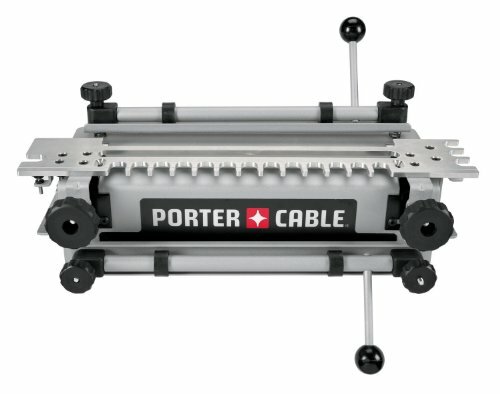 Porter-Cable is a well-known brand in the tools industry. Their products manifest exceptional quality and latest innovations in all fronts. This dovetail Jig 4212 12 inch tool is one of Porter-Cables greatest innovations. It is an excellent tool for woodworkers to use for the construction of various projects. The features packaged in the product and build make this model a handy tool that users appreciate to own. Versatile – this Jig is a versatile piece that can be used to cut various dovetail joint types including half-blind dovetails and box joints. This Jig can also be used to create dovetail dadoes in wooden materials. 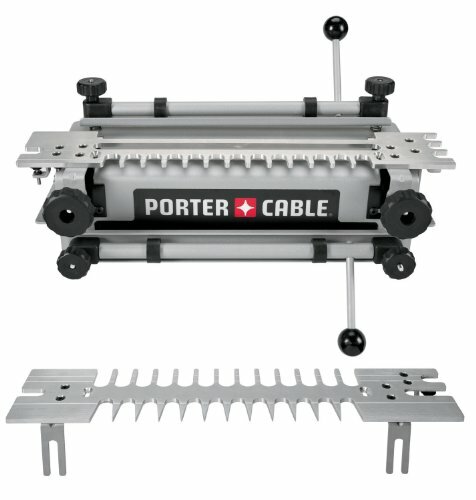 Excellent build quality – this Porter-Cable Jig is a tool that once purchased will give you a performance that will last long. It features a robust steel base and is also equipped with aluminum built CNC machined templates that make a durable construction that is long lasting. Provides accuracy and precision – this is thanks to the 2 carbides tipped bits and the template guides. Also, the tool has two lock nuts and is provided with a user guide to help you make the best cuts regarding accuracy and precision. Additionally, the Jig is designed with Template alignment lines and a router bit depth setting gauges that help you to create exceptionally strong, tight and durable joints. 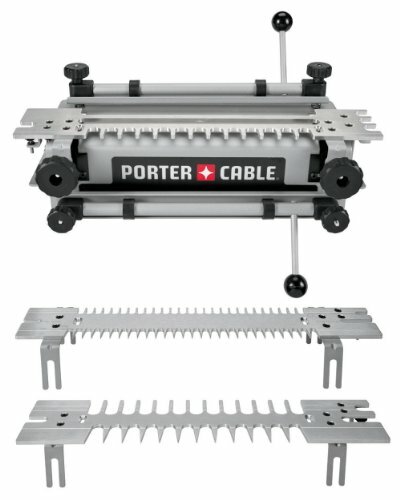 Warranty provided – when buying and using this tool by Porter-Cable, you don’t have to worry about its quality. This is not just because it is a reputable brand but because the brand itself assures you of its quality through the one-year free service contract warranty and a three-year defects warranty for faulty parts. It takes a lot of time to set this Jig up. Weighing the pros and cons of this product, the conclusion is evident that the tool is a good buy. 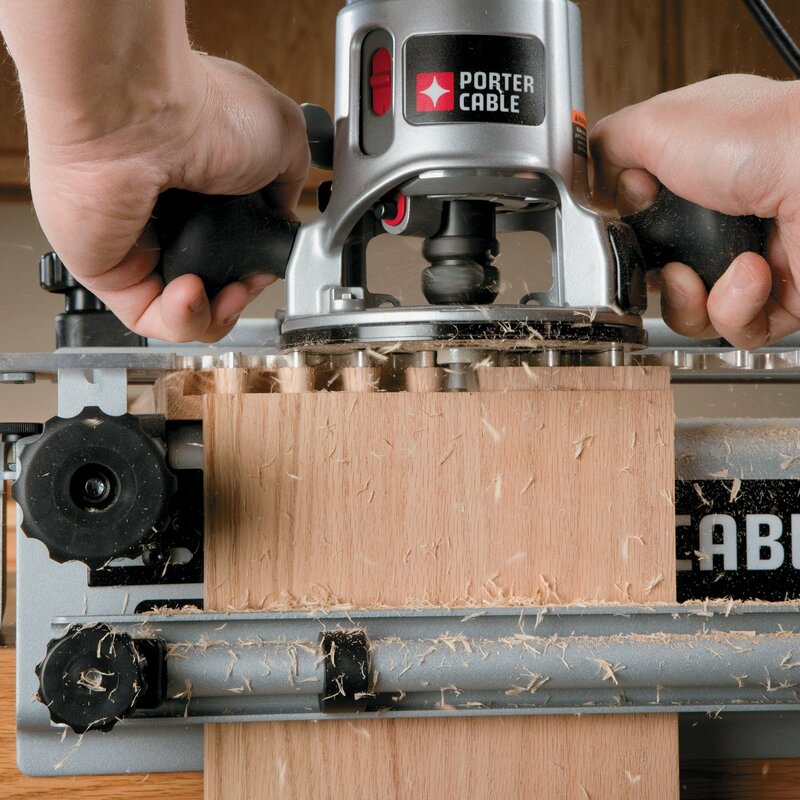 The quality, ease of use and accuracy that accompanies this Porter-Cable Dovetail Jig is just unmatched. You can make a lot of beautiful and aesthetic joints using this Jig. This 4216 super Jig is also another one of Porter-Cables greatest dovetail Jigs. The best thing about this particular Jig is the fact that it has a variety of templates to get most woodworking projects done. So if you need to make fancy, strong and durable joints, then this Porter-Cable 4216 super is the right tool for you. It is super effective and they best part is that it is well priced. It is versatile and flexible – unlike most Jigs that limit the variety of joints you can make, this particular Jigs is equipped with enough templates i.e. templates 4211, 4213 and 4215 that enable you to make most types of joints in constructions. With this tool you can make half-blind joints, miniature box joints, rabbeted half-blind joints, and sliding dovetail joints in a variety of applications. Durable construction – this dovetail Jigby porter cable is designed and built for durability. The single steel base design provides users with long lasting flexibility where you can use the tool in a variety of applications and that too for a long time. Holds wood firmly and steadily – the Porter- Cable 4216 model is quite efficient as it provides you with a firm grip of materials when cutting.With this tool you can make accurate and precise joints on wood as the firm grip provides you with a steady platform all thanks to the heavy duty clamps and sandpaper backed locking bars that assist in holding and locking the wood in position. Easy to set up and use– the Jig comes equipped with two nuts, a wrench, and instruction manual for user. With the help of the manual you can easily set up this tool within a very short time and even get to use it immediately. What’s more is the router bit depth gauge that allows you set the bit depths for every project without having to measure it which in turn saves a lot of project time? Overall, this Porter-Cable tool is a good dovetail Jig for the money. Its features and overall versatility makes it an ideal tool for use in almost any type of woodworking project. The Keller dovetail Jig 135-1500 is a woodworking tool capable of cutting through wood and making holes for constructions. It is an excellent dovetail Jig for beginners as it comes with a variety of functions applicable in many type of projects. Also, considering the features and benefits of this product that we are going to mention here, you will agree with me that at an average of $160, this tool is truly a bargain. Enables you to create fast and accurate wood projects – this is what is expected of a good quality dovetail Jig; precision and accuracy. Equipped with a 15-inch precision milled template, users can use this Jig in any kind of application to create wishful cuts and holes in wood materials. Easy to operate and clean - it comes with a phenolic guide and user manual with illustrative instructions meant to guide beginners on how to set up and operate the various functions of the tool for efficient joinery. Can be used in a variety of applications – like the 2 Porter- Cable Jigs mentioned above, this Keller Jig is also versatile in a similar way. It is packed with a standard dovetail bit template for straight bit and ball bearing. With this, you can cut materials in various angles and shapes i.e. acute, obtuse, compound-angled and even curved dovetails and knuckle joints.It is also worth mentioning that this tools accepts wood of unlimited lengths and widths. According to various testimonies by customers, this Jig is supposedly the easiest to use and is very productive if used well. Although the price is not really cheap nor expensive, with all the features presented by this tool, it is a good buy for those who can see and understand its value. You might be wondering why it took three products to reach to a Leigh Jig. Well, the reason is pretty obvious; Leigh dovetail Jigs are very expensive. This tool is not the best recommended dovetail Jig for the money unless you want the additional adjust ability features that the tool offers. In all honesty, this product is of great quality, its quality is within the same lengths as the Porter- Cable Jigs only that the prices of the two brands are miles apart with the Leigh costing a whopping $100 more than the Porter-Cables. So what does thisLeigh super 12” Jig have to offer? 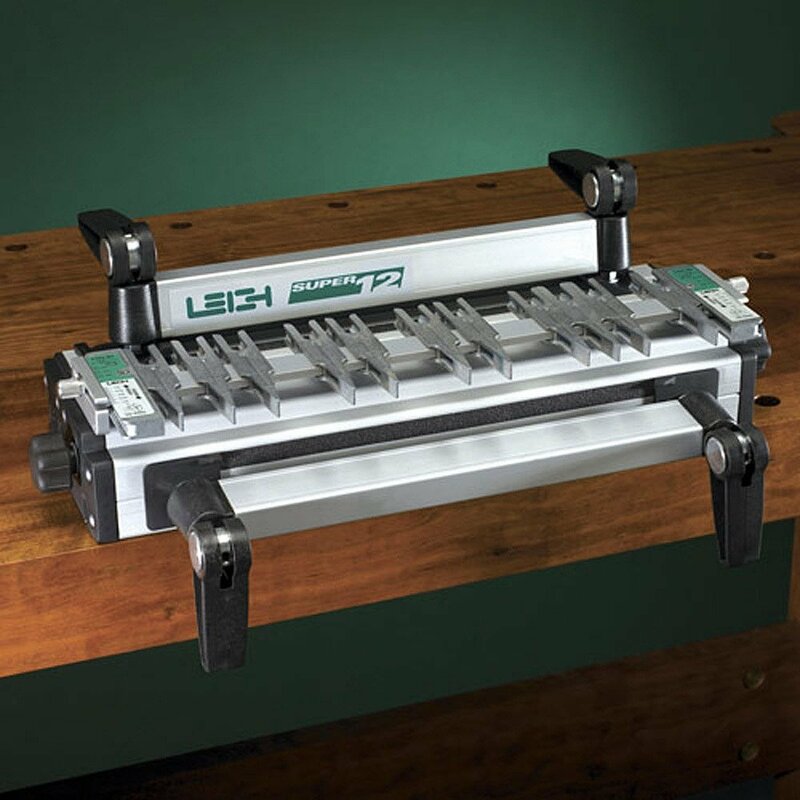 Has impressive adjustable options – unlike the Porter Cable Jig that have a fixed dovetail width, this particular tool has adjustable features i.e. pins that allow you cut dovetails of whatever widths you so desire. Besides the width, this Jig also allows you to adjust the spacing to varied sizes depending on what your project requires. Easy to use – the tool is pretty easy to use but only after you have gotten around all its features and functions. Yes, it takes time to get around the tool but once you do, you get to enjoy the easy adjustable pins with markings that clearly direct you on which way to adjust the pins for easy, fast and accurate cuttings. Solid construction – the body and guide of this Jig are made with metal alloy and aluminum which are all materials known to be highly strong and durable. Also, the cam levers are made of some kind of high quality plastic that shows how well-crafted the Jig is solely for long lasting performance. This dovetail Jig is highly priced. At this price, this is probably the most expensive Jig in this list and in the market. It is not the best choice for those looking for something affordable. Best suited for professionals as learning how to use this Jig is not easy. As seen from the drawbacks, this dovetail Jig is definitely not for beginners or those looking for first time easy to set up and use kind of tool. Although, it is supplied with DVDS and instructional manuals on how to use, comprehending the contents and instructions provided takes time. If your main concern is flexibility and price is of no worry, then you can buy this Jig. Otherwise consider other cheaper brands like Porter-Cable. And our last product on the list is the Porter-Cable 4210 12 inch dovetail which is also the cheapest on the list too. Contrary to the momentum the first two Jigs from Porter-cable have set, this dovetail Jig does not seem to impress most quality lovers. Hover, for light projects and of the beginner woodworker, this can work well in helping you learn how to use a dovetail Jig and also get to know its basics. Affordably priced – this is what most notable in this product. It retails under $120 in most stores and would make the perfect dovetail Jig for the money for most affordability oriented buyers. It is versatile and built to last - The Porter-Cable 4210 Jig is versatile and built to last with its thick steel base that makes it durable and strong. It also comes with CNC-machined aluminum templates that will enable you to create box joints, half-blind dovetails, miniature dovetails, and dovetail dadoes. This Porter Jig also has a carbide tipped dovetail bit, a lock nut, a user manual, and a template guide for ease of use. It is not so easy to use. Like I said, if you are more focused on affordability then go for this Jig but if you want quality and efficiency combined with affordability then the Porter-Cable 4212 12 inch is a better choice. Since the innovation of Jigs, various power and hand tools manufactures have taken responsibility of making dovetail Jigs. These companies make the Jigs in a variety of models, sizes and with varying features. Regardless of the type of woodworking project you want to partake, you must give consideration to the various features of these Jigs during the buying process. Based on the features, you need to determine what types of joints you are going to make. You also need to consider the accuracy and precision you need for the joints. Still on features, you should decide whether you want a Jig with dust collection abilities or not and if you do, how effective and big should it be? These are just some of the features you need to look into when selecting a dovetail joint tool. Another thing you need to factor in is the ease of use. Remember that an excellent woodworking tool needs to be user friendly and in this regard, you will find in the market Jigs that are easy to set up and use. There are also Jigs that are designed to handle more complicated tasks and these come with a variety of adjustment features. With consideration to your needs and budget, you will have to determine whether you should buy a basic model with few tweaking abilities or a complex Jig with flexible features. On what brands to choose, there is a variety of brands options to choose form. Popular brands like Porter-Cable and Leigh offer top quality products with interesting warranties. Other manufactures of dovetails Jigs include, Woodstock, Keller, Eagle America and Rockier who also produce some good quality Jigs. 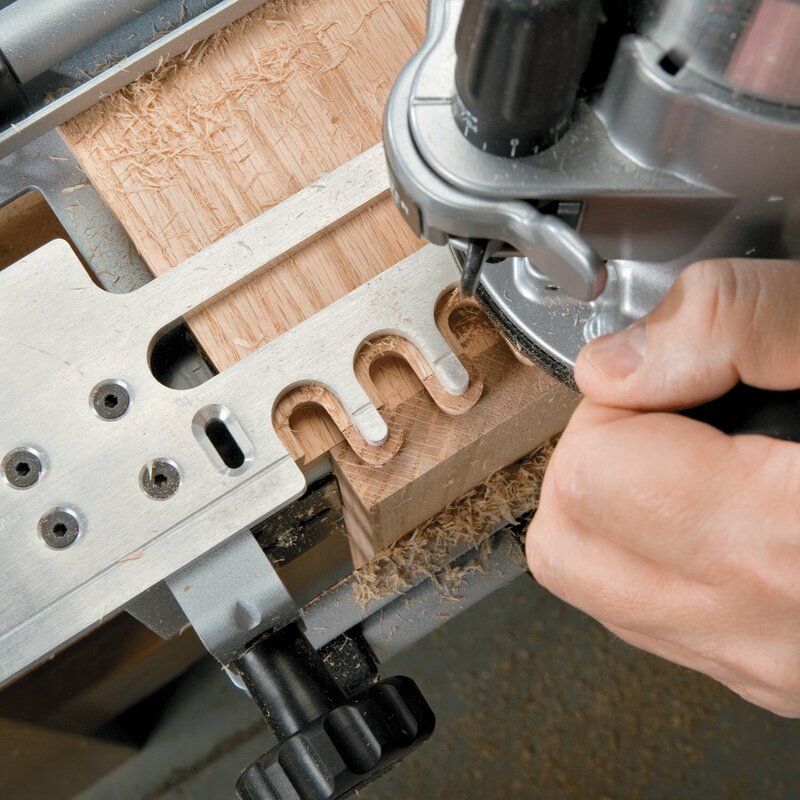 If you are a frequent buyer and user of power and hand tools, at this point you might have already identified a favorite brand, but regardless of this, you still need to do proper research and choose a brand that offers significant features that you need. Woodworking requires skills and a great attention to details. A simple ﻿﻿mistake﻿﻿ made during construction can ruin the entire project. It is for this reason that one needs to be well informed of the various essential skills, secrets and factors that are commonly involved in woodworking as a whole. A good factor to master is to know the various ﻿﻿﻿﻿tools needed for each specific task. The dovetail Jig for example should be considered anytime you want to make dovetail joints in wooden pieces. This will help you avoid ﻿﻿common mistakes and as a result be able to make desirable constructions. Dovetail Jigs as woodworking tools have been in existence for quite some time. The tools still remain popular amongst craftsmen even in this age where computerization has become the norm in almost every field. But why so much popularity? Using a dovetail Jig as seen above is very helpful where accuracy, time efficiency and precision is required. Every Jig is manufactured and supplied with a given set of instruction for users. Therefore, users tend to take very little time setting up and getting to use these tools the first time. Like I said earlier in the article, there is a large variety of Jigs in the market today and at that these tools come in prices and features that vary greatly. Likewise, the simplicity of using these dovetail Jigs also varies significantly. Often times you will find woodworking tools that take ages to figure out the first step to using it while some take very little time and effort to use. Whatever the situation, the best way to avoid facing difficulties with any power or hand tool is by making use of the provided user manual and instructions. Also, watch YouTube videos that guide you visually on h﻿﻿ow t﻿﻿o use the specific to﻿﻿o﻿﻿﻿﻿﻿﻿l. All in all, using this type of Jig can be very useful and fun. However, it can also be dangerous if not handled properly. So apart from reading the manuals, read the safety precautions as well and follow them to the latter. Moreover, do not forget to protect your body from any harm associated with using a Jig. For example, always wear safety goggles to protect your eyes from flying wooded specks. As we come to a conclusion, I can’t emphasize enough the association between a dovetail joinery and quality workmanship. Making use of these joints in your woodwork constructions will elevate your art to a whole new and interesting level. And although, the joint can be made by hand, the quality and aesthetic appeal cannot be matched with that made using a good quality jig. Therefore, invest in the best quality dovetail jig you can afford and watch your constructions turn out in the act same way professionally made pieces do.